The CSA season has begun, we are off and rolling! Uphill… with a headwind. There is a newsletter posted online here. Our early CSA crops were set back significantly with the snow and rain this spring and recent hail, so our first shares are meager. It feels indescribably wonderful to feed people, to share the bounty. And on the other hand, we feel absolutely cruddy sharing a weak harvest. It’s just the beginning of the season. Things are growing slowly, and that’s what they are supposed to do. This is a part of eating locally and eating seasonally. 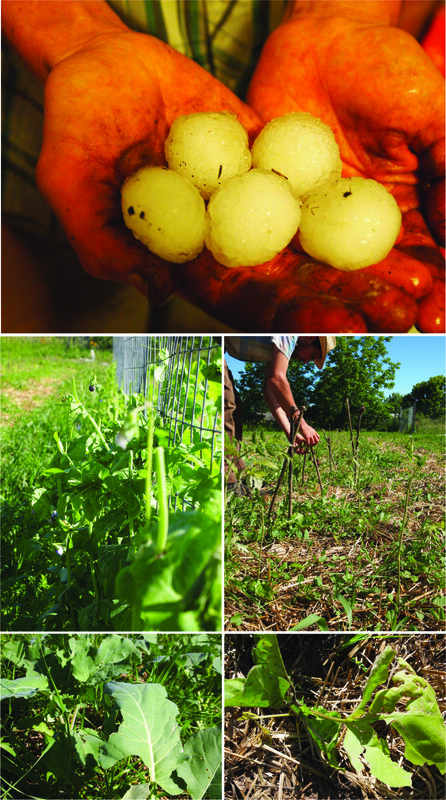 We have worked hard to select varieties and manage crop planting calendars to structure a good CSA season. But we’re also in this intimately with Nature, and when she’s cold and wet, well.. so are we. We have learned a good deal, there are certainly things we’ll plan better for next year in order to be more bountifully prepared for our early CSA shares. Meeting with everyone last week during the pick-up was a wonderful summary to a very busy, stressful, anxious past few weeks. We are so thankful for our CSA members’ graciousness and understanding. We’re looking forward to a bountiful season with you, friends. Thanks for your patience and sticking with us. On this past Saturday afternoon, we were pummeled with ping pong ball sized hail. We’d never seen anything like it. They beat the field down a fair amount, some spots/crops fared better than others. Winds from the west battered peas on the west-side of the trellising, but east-side plants were somewhat protected. Eggplants look pretty sad, but only a handful actually snapped at the stem, most just lost leaves and are already sending out new ones. Several tomatoes snapped, Jeremy set immediately to bracing them up (maybe they’ll recover?). And we have the comfort of several tomato plants in the greenhouse. The squash had only just sprouted, and as such small targets, we didn’t lose but just a few. Contrarily, the lush, leafy cabbage looks like it got in a knife fight.. or a garbage disposal. So we’re feeling pretty grateful. 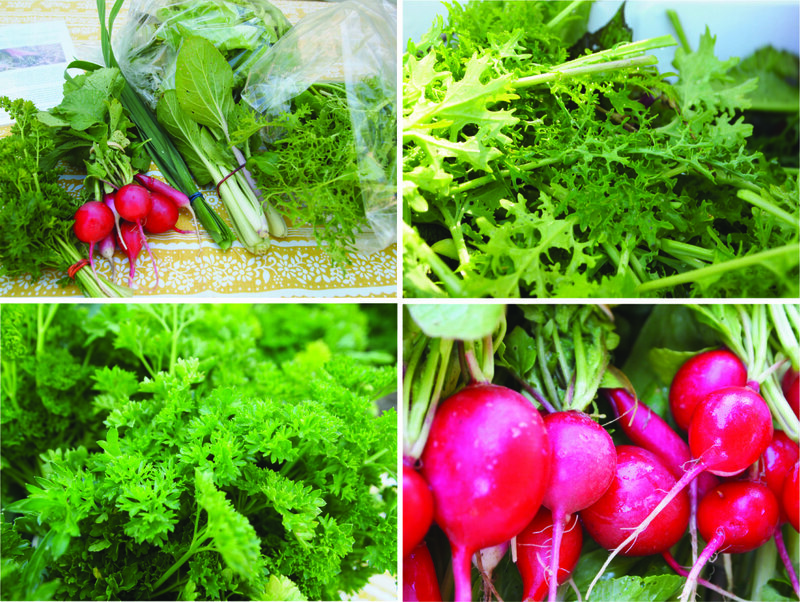 Things are ok. We’ll have “perforated greens” for the CSA this week and hail-kissed snap peas. Ice-massaged spinach. You know, real ‘foodie’ foods. Just like Kobi beef and kopi luwak. We were completely taken with this hedge of flowers these last couple weeks. Turns out everyone else was too. It was covered in a veil of buzzing pollinators. Flies and bees, honey bees and bubble bees. Oh so ridiculously happy. 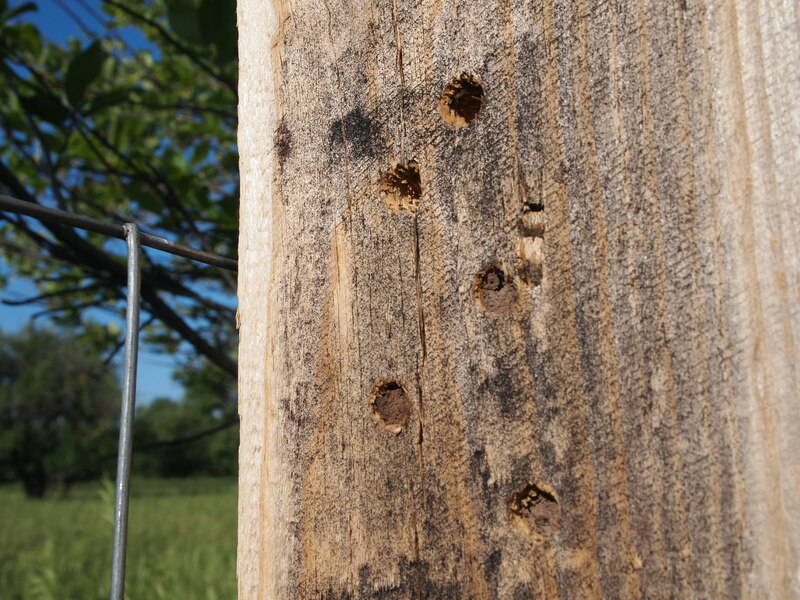 We’ve also been watching mud caps fill in on the solitary and mason bee homes we drilled into the fencing posts earlier this spring. 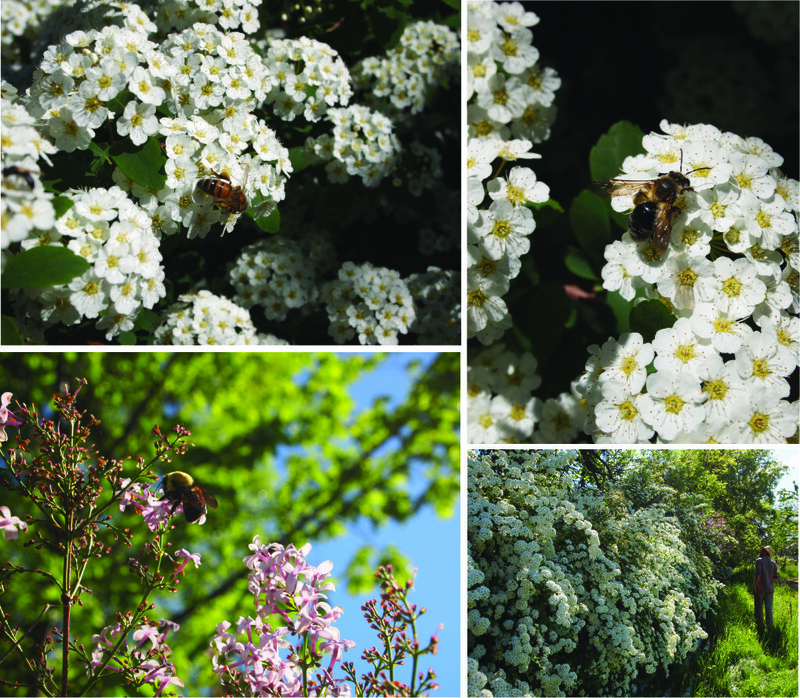 If you are interested setting up homes for native pollinators – or just learning more about these important little creatures, check out The Xerces Society and this article, Farming for Bees, guidelines for providing native bee habitat on farms. 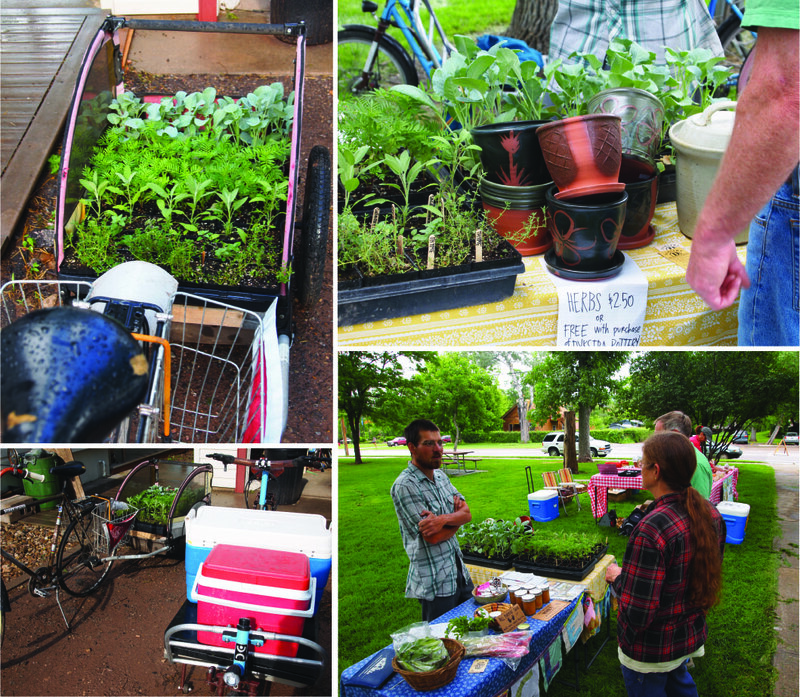 We are looking forward to this season’s Farmer’s Market in the Park, Saturday mornings (9 AM to noon in Spearfish City Park). We take our produce to market by bicycle. Please come stop by the market and say hello. Days on the farm are generally pretty quiet – we’re grateful for a chance to connect with people and see smiling faces. This past Saturday, we brought herb and flower starts, honey, mixed lettuce greens, rhubarb and parsley. Everything grown on our farm. Hope to see you at the park this summer. And lastly… many thanks, friends, for all your concern and support during our hail re-hab. Every email message, phone call, and friendly face stopping by to check in was dearly appreciated. Thank you. Our greens may be battered, but our hearts are full.